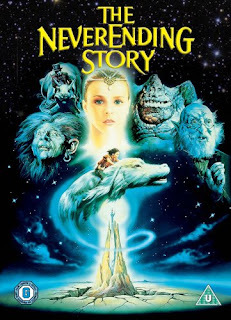 Bastian, a lonely schoolboy, alienated from his father and bullied by his classmates, retreats to an attic where he becomes engrossed in a book entitled "The Neverending Story." It is the tale of a magical kingdom named, appropriately, Fantasia, since it is a world born of human fantasies. Fantasia is being destroyed by great storms of Nothingness as mankind loses faith in the powers of imagination and fantasies die. Dangerously ill herself, Fantasia's youthful empress sends a handsome warrior on a quest to find a cure for both her and her kingdom. After encounters with flying dragons, swamp monsters and a vast assortment of other fantastic creatures, the young hero discovers that only a human boy can save Fantasia, at which point Bastian is drawn, literally, into the pages of the story. This is undisputed(ly) one of the best films to ever grace the silver screen. I am bias of course to one thing; good film making. I am always intrigued by a good story, and more importantly a good story that the whole family can enjoy. I can not speak highly enough for this film. If you missed the opportunity to see this as a child, you missed a lot. I give this film a firm 5/5 "Roos"